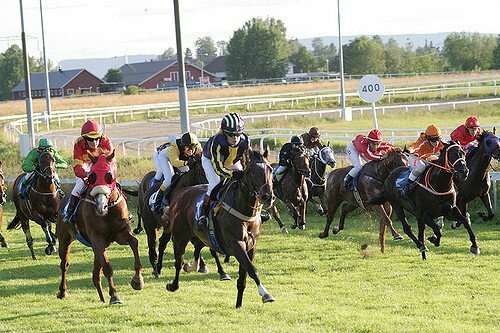 Horse racing is an extremely dangerous sport for both horse and rider. However, these horses receive the best care and the best racehorses enjoy what they do. Despite this, there is no escaping the horrible, often fatal injuries which occur on the track. There was a horrible accident at my last shift at the racetrack. Just before the finish line a horse broke its leg and caused too much damage to recover, so sadly it has put out of its misery. It is very sad and quite traumatic to see. However, I felt like it was important to explain the silver lining of this event, before the horse just became a number on Animal Aid. The ground team did an amazing job responding to the accident. Just minutes after the accident, the horses suffering was ended. I feel it is important to emphasize how impressive this is. These injuries can happen in other equine disciplines, but it is unlikely that the ground crew would be able to act so quickly or effectively. So although these accidents are terrible, I think we should try to remember that racehorses have the best health care and any suffering is quickly addressed and resolved in the best way possible for the horse. Not impressed. They’re items used for money. Disposed when no longer useful. Raced on young bodies incapable of carrying that load. Who ever decided it’s OK to retire at age 6 and call that a good career. I’m sorry, but I disagree with most of what you said. However, this post wasn’t about the good and bad of racing. It was about how quickly the ground crew responded to assess and help the horse. It is horrible that these things happen, but I truly believe that there is a silver lining, which is that the animals suffering was very short. Just feel strongly against the horse racing industry at large. I do however agree that it’s GREAT the animal was tended to so quickly. We all shuddered in the Endurance race last year when that poor horse stood, or tried to stand, on two broken front legs for much longer than 20 minutes, while nothing was done. This ground crew was a huge improvement on that, of course! No worries. I can totally see why people are against horse racing. But the more I see, the more I realise there are so many great things coming out of it.